March 13, 2017 (DALLAS, TX) – Boxer Property is pleased to announce that it has concluded lease renewal negotiations with NTT Data, Inc., a global IT services provider. 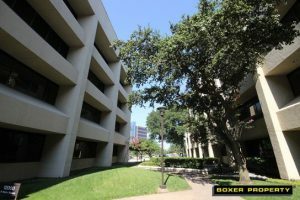 As a valued Boxer Property tenant since 2013, the technology service company retains their 20,256 square foot space located at 12000 Ford Road in Dallas, TX. Alexander Renwick, Senior Broker, represented Boxer Property during negotiations. Shelly Christenson, Senior Managing Director of E Smith Realty Partners, represented the tenant. Located in the Farmers Branch area of Dallas, TX , 12000 Ford Road features 158,004 square feet of office space for rent. Also known as III Metro Square, the property is conveniently situated near I-635 and I-35E. The building consists of a myriad of amenities including on-site maintenance and management, 24-hour access, abundant parking, conference room usage, on-site FedEx and UPS drop boxes, and internet ready suites just to name a few. The property is sure to impress visitors with its recently renovated lobbies, beautiful landscaping, and spectacular views of Dallas and Farmers Branch. NTT DATA is a top 10 global business and IT services provider with 100,000+ professionals in more than 50 countries, and is part of Tokyo-based NTT Group, a partner to 85 percent of the Fortune 100. NTT DATA partners with clients to navigate the modern complexities of business and technology, delivering the insights, solutions and outcomes that matter most. The company delivers tangible business results by combining deep industry expertise with applied innovations in digital, cloud and automation across a comprehensive portfolio of consulting, application, infrastructure and business process outsourcing services. Boxer Property is celebrating its 25th year anniversary as an innovative commercial real estate investment and management company that specializes in maximizing the value of under-performing and challenged properties through aggressive leasing and hands-on management. Founded in 1992, Boxer Property Management Corporation is a privately held firm based in Houston that manages, leases, and administers retail, medical, hospitality and office properties with over 15 million square feet across more than 120 locations, nationwide.